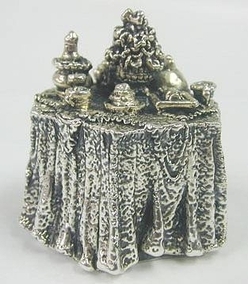 sterling silver set dining table miniature Highly sought after by collectors this highly detailed miniature is of a dining table covered with a tablecloth set for dinner with different dinner courses such as fish, meat dish etc, with a lovely floral centerpiece on its middle. This item was made in the electroforming method. Measurements: Width: 1.95in. 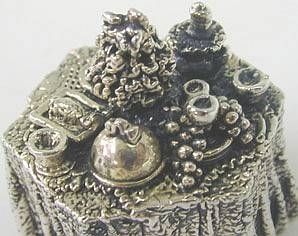 / 4.95cm. Height: 2.24in. / 5.7cm. Weight: 85.5gr. / 2.75oz. Marks: 925 for sterling silver.